The research by LSU following its amazing comeback at Missouri is on-going. Trailing by 14 points with slightly more than two minutes to play, LSU went on a 15-1 game-ending run to force overtime. Nine points by Skylar Mays in less than 30 seconds started the rally, which concluded on a foul shot by Emmitt Williams with two seconds remaining. Then, two Ja’vonte Smart 3-pointers in overtime carried LSU to an 86-80 victory against Missouri. At the one-third mark of the Southeastern Conference schedule, LSU is tied with No. 1-ranked Tennessee with a 6-0 record. Since 1967, LSU rallied from at least a 14-point deficit to win five times before Saturday. The Tigers’ biggest comeback occurred in 1967 when they erased an 18-point deficit to beat Ole Miss. Six seasons ago, LSU came from 14 points down to knock off Mississippi State. Tigers coach Will Wade was truly excited following the massive comeback. But, he was also realistic enough to understand that such victories occur “once every 500 games.” Such a victory definitely can jump-start a team into having a special season. LSU has a 16-3 overall record – its best mark after 19 games in 19 seasons. The 2000 Tigers team, which tied for the SEC title, also had a 16-3 record. For just the third time in the last 50 seasons, LSU has gotten off to a 6-0 league start. The 1981 and 2006 Final Four teams were the other squads to be 6-0 in the SEC. So, the 2019 edition of the Tigers is joining some lofty company with their achievements this season. LSU is finding different ways to win games. In each of the last three games, the Tigers have shot worse than their opponent from the field and still came away with a victory. Just two of LSU’s six SEC opponents have a winning record in the conference – South Carolina at 5-1 and Ole Miss at 4-2. The Tigers will face two more teams with losing conference records this week – at 1-5 Texas A&M on Wednesday and 2-4 Arkansas at the PMAC on Saturday. Then, the schedule begins to become far more challenging – beginning on Feb. 6 with a game at Mississippi State. 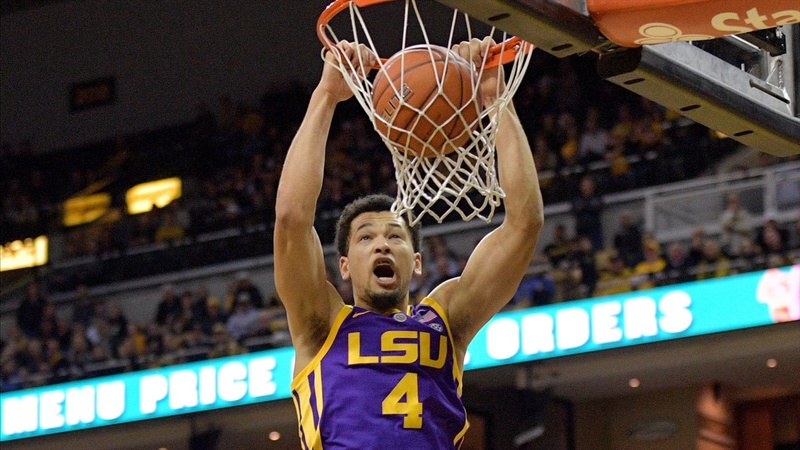 Following a home game against Auburn, LSU visits Rupp Arena to take on Kentucky. Tennessee comes to the PMAC on Feb. 23. Rightfully so, everyone is reveling in the LSU’s amazing come-from-behind victory at Missouri. However, more so than at any time, the 24-hour rule needs to be adhered to by the Tigers players. When LSU begins preparations for Texas A&M on Monday, that victory against Missouri must be forgotten. There is much work ahead for a Tigers team, which still has 12 SEC games remaining. A 6-0 record can quickly deteriorate if members of the team lose focus. That’s the task for Wade and his staff as LSU gets ready for its fourth week of the SEC schedule. It’s time for the Tigers to pay even more attention to details in an attempt to stay in a contender’s role for the SEC championship during the second third of the conference schedule. Here are LSU’s games in the second third of their SEC schedule. Here are the statistics for LSU’s rotation players in the first six SEC games.